What ails Tim Burton’s Dark Shadows reboot can be summed up in three words: Jonny Lee Miller. Not that there’s anything wrong with him. He is a fine actor let down by movie in which his character Roger Collins – a sleazebag descendent of vampire Barnabas Collins (Johnny Depp) – is so thin that he’s practically translucent. There’s no real point to the character or to casting a recognizable name to play him. There are many more missteps in this uninspired horror comedy, but the misuse of Miller is symbolic of the whole sorry enterprise. This eighth collaboration between Burton and Depp ought to be grounds for their divorce. At this point, they are only bringing out the worst in each other. Unlike the recent 21 Jump Street – in which Depp shines in a cameo role – that simply took the premise of the original TV series of cops masquerading as high school kids and spun it into a completely new story, Dark Shadows hews closer in some aspects to the Gothic TV soap opera that inspired it. Freed from his coffin after 200 years, Barnabas returns to his Maine estate Collinwood and discovers that his once powerful family has fallen into such a state that they cannot even afford the upkeep on the mansion. The town, Collinsport, might still bear the family name, but it is Angelique Bouchard (Eva Green), the witch who cursed the family in the first place, who rules it. Replacing the melodrama of the original series is weak comedy. The story is credited to two writers, frequent Burton collaborator John August (Big Fish, Corpse Bride, Charlie and the Chocolate Factory, as well as the upcoming Frankenweenie) and Seth Grahame-Smith (who also wrote the screenplay) and it’s an incoherent mess that appears to take a checklist approach to the supernatural elements of vampire, witch, ghost and werewolf. The tale is set in the 1970s, apparently for the sole reason of mining weak jokes from the 18th-century vampire’s fraught interactions with lava lamps, Alice Cooper, The Carpenters and Roger’s double-knit polyester leisure suits. Talented actors like Miller, Michelle Pfeiffer as lady of the manor Victoria Collins Stoddard, Chloe Grace Moretz as Victoria’s surly daughter Carolyn, and Burton’s partner Helena Bonham Carter as the Collins’ drunken live-in psychiatrist Dr. Julia Hoffman are on hand to decorate the scenery, but this is Depp’s show. Once again, he’s that guy, the willful eccentric, the lovable rapscallion ever ready with a quip, and catnip for the ladies, this time despite Barnabas’ deathly pallor, ridiculous haircut and claws so lethal looking it seems apparent that the good-natured bloodsucker spends a lot of his free time sharpening them on the lid of his coffin. 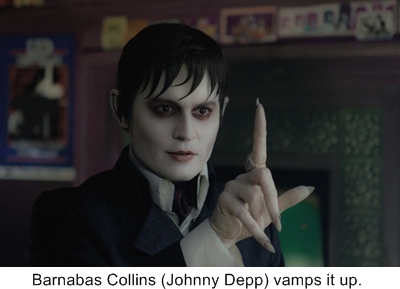 Barnabas is less a character than a cartoon and in Depp’s universe, only too familiar. Depp has become his own stereotype, self-consciously odd and overly broad. It’s a lazy abuse of genuine talent and it stopped being cute at least three Pirates of the Caribbeans ago. Perhaps what is most shocking about Dark Shadows is how little imagination seems to have gone into it. At his worst, Burton’s films have always at least offered dazzle. While at times that means the movies seem more art directed than directed, they’ve also been gorgeous eye candy. Dark Shadows is downright dowdy. It’s a sad thing when the most memorable image in a Tim Burton film is Bonham Carter’s red wig.